The Presentation of Jesus in the Temple celebrates an early episode in the life of Jesus. It falls between the Feast of the Conversion of St. Paul on January 25th, and the Feast of the Chair of St. Peter on February 22nd. In the Roman Catholic Church, the Presentation of Jesus in the Temple is the fourth Joyful Mystery of the Rosary. The event is described in the Gospel of Luke, 2:22-40. According to the gospel, Mary and Joseph took the baby Jesus to the Temple in Jerusalem forty days after his birth to complete Mary’s ritual purification after childbirth, and to perform the redemption of the firstborn, in obedience to the Law of Moses, Leviticus 12, Exodus 13:12-15. Luke explicitly says that Joseph and Mary take the option provided for poor people, those who could not afford a lamb, sacrificing a “pair of turtledoves, or two young pigeons”. Leviticus 12:1-4 indicates that this event should take place forty days after the birth of a male child, and that is whey the Church celebrates the Presentation in the Temple forty days after Christmas. 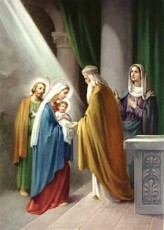 As they brought Jesus into the temple, they encountered Simeon. The Gospel records that Simeon had been promised that “He should not see death before he had seen the Lord” Luke 2:26. Simeon prayed the prayer that would become known as the “Canticle of Simeon”, which prophesied the redemption of the world by Jesus: “Lord, now lettest Thou Thy servant depart in peace; according to Thy word; for mine eyes have seen Thy salvation, which Thou hast prepared before the face of all people; to be a light to lighten the gentiles and to be the glory of Thy people Israel”, Luke 2:29-32. Simeon then prophesied to Mary, “Behold, this child is set for the falling and the rising of many in Israel, and for a sign which is spoken against. Yes, a sword will pierce through your own soul, that the thoughts of many hearts may be revealed”, Luke 2:34-35. The Elderly Prophetess Anna, was also in the Temple, and offered prayers and praise to God for Jesus, and spoke to everyone there about Jesus and his role in the redemption of Israel, Luke 2:36-38.